Good day, people! Here is hoping that you’re doing well today. Had meant to say this before last week’s blog but it slipped my mind while writing that up. April 2019, the month that we’re in, marks five years since I first started blogging for Diary of a Crossword Fiend. Two things come to mind immediately: 1) I can’t believe five years have passed so darn fast! ; and 2) I can’t thank Amy and every Fiend blogger past and present enough for accepting me into your community, and I thank all of the commenters and Fiend supporters so much for being willing to take in the thoughts of this sports-inclined, travel-weary, excessively self-deprecating crossword lover on a daily basis for three years, then on an intermittent basis, and now on a weekly basis. You all rock! 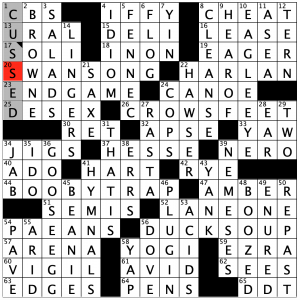 OK, now I’m putting the Kleenex tissue down to talk about today’s Crossword Nation grid! If CHARLIE CHAPLIN were alive today, he would be celebrating his 130th birthday on Tuesday (61A: [Born on 4/16/1889, the author of today’s quote (and whose emoticon is in the puzzle title!)]). The grid is a cheeky way to celebrate his life, which includes a pretty slick emoticon on the title of the grid, one that definitely resembles the comedic genius a little, from the top hat to the miniature mustache. Obviously, you have to tilt your head to the left to see it. Oh, and there’s a quote attributed to him and a movie he was in that also is part of the overall tribute. 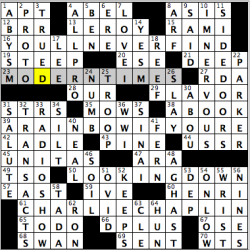 Absolutely got snared at the very beginning of the grid, quickly typing in “abyss” instead of ABYSM, which made the theme of “Modern Times” not appear to me until the very end of solving (1D: [Bottomless gulf]). Also was thrown off by the unfamiliarity of coming across TRUED and trusting that was the entry for its clue (3D: [Brought into alignment]). The long down fill entries were fun, though it reminded me of my very brief RADIO SHOW that I hosted down in Salisbury, MD where I played Top 40 radio under a pseudonym (33D: [Rush job?]). Not that I loved Top 40 radio before that, but I absolutely had enough of it after my couple of spots on the radio as a music DJ. If anything, outside of my podcast (please subscribe if you haven’t done so already, either on iTunes or Google Play Music), I would love to host a smooth jazz radio show, as that was a dream for years! 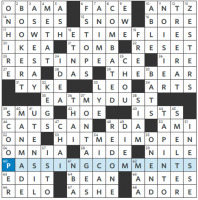 Nice little shoutout to a few important PARKERs, including the man who has continued to be a beacon for so many crossword puzzle fans to talk about puzzles and the continued improvement of them, as well as one of my musical heroes in Yardbird a.k.a. Charlie Parker (22D: [Rex, Charlie or Sarah Jessica]). No shoutout to Peter, everyone’s favorite Empire State University student/scientist/radioactive spider-bitten superhero? “Sports will make you smarter” moment of the day: UNITAS (45A: [Legendary Colts QB Johnny]) – The style of play that almost all football teams today, from elementary school to the pros, hope to achieve from their quarterbacks can easily be traced back to the person who is widely considered as the prototype from which most quarterbacks are molded from, the late, great Johnny Unitas. Playing for the Baltimore Colts (the Colts did not move to Indianapolis until 1984), Unitas, during an era where the forward pass was still considered more of a gimmick than a strategy to build an entire game plan around, became one of the first great passing quarterbacks in the NFL, winning the league’s Most Valuable Player in 1959, 1964 and 1967. From 1956 to 1960, Unitas set an NFL record by throwing for at least one touchdown pass in 47 consecutive games, a record that’s mind boggling for a couple of reasons: 1) This streak came in an era where the forward pass was not nearly as emphasized as modern-day football, and 2) The record stood for 42 years, only broken in 2012 by New Orleans Saints quarterback Drew Brees. To put a bow on this, know that Brees, who will join Unitas in the Pro Football Hall of Fame, won his one and only Super Bowl to date in the 2009 season, where his Saints defeated………………….the Indianapolis Colts! Thank you so much for the time, everybody! Have a wonderful rest of your Tuesday and, as always, keep solving!! I liked it! Each themer refers to something you would say while something (time, a person, a competitor, a football) is being passed. I appreciate a consistency to the themers, even as the meaning of PASSING changed from one to the next. I also appreciated AS WE SAY at 3D, as an extra nod to the theme set. – I love any grid that starts off with Michelle OBAMA or an equally influential and admirable woman at 1A. – I was less excited to see ANTZ clued with respect to Woody Allen. With how problematic he is, this could have been clued in literally any other way so as to leave him out. – AMI [Friend from France] captured my attention because of the tragic burning of Notre Dame today. I hope all of our friends from France are doing OK, all things considered. – 9D: There are gay sheep, just like there are documented cases of gay animals of many varieties. A EWE is not always a [Ram’s mate]. That’s all for today. Congrats on getting through Tax Day … unless you asked for an extension! Early wake-up tomorrow, so let’s be quick. The theme is “things that end with the ‘kay’ sound but are spelled all different ways”: COMMUNIQUE, TOOTH DECAY, SOBRIQUET (which I may never have heard spoken—dictionary tells me you can end it with the -kay or -ket sound, so if you’ve always heard -ket, you’re going to fight this theme), MURRAY THE K, ARE YOU OKAY. 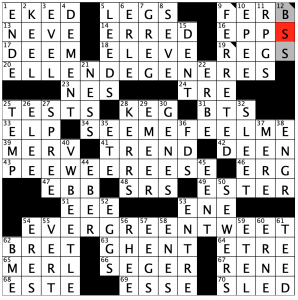 There are some entries that feel out of place in a supposedly easy Tuesday puzzle: RACEME, GESTE, DYNAST, ROSTRA, ESSO, DITS, SETTEE. Other junky fill: the trio of ENE, SSW and –ERN; O SAY. 46d. [Cinch ___ (commercial trash bag name)], SAK. It’s possible that Hefty no longer offers this trade name. 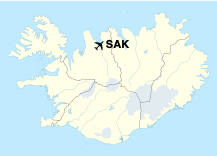 Anyone know of another legit cluing approach for SAK? 44d. [Non-prophet foundation? ], ATHEISM. Cute, I guess. 55d. [“___ Hope” (classic soap opera)], RYAN’S. It ended just over 30 years ago. I watched it in the ’80s (I was a sucker for Irishness) but if you’ve never heard of it, I hereby excuse you from needing to think it’s at all relevant. I Googled “evergreen tweet”, and I still don’t quite understand where the term came from, but if something is “evergreen” it is universally relevant, but on Twitter that would be highly subjective, wouldn’t it? Still a great entry, and with the prolific use of Twitter still seeming to grow, this is very current and timely. Great job, Matt! This puzzle is a feat of construction. I do not have this level of skill in constructing, so I am highly jealous. 4.8 stars from me! There are so many E’s, I thought I would point outthe entries that have ZERO E’s! 31A [K-pop group with a 2019 Grammy nomination] BTS – Just like 54A seems quite timely, this entry is also highly relevant. This Korean group just performed on SNL this past weekend, becoming I believe the first Korean (were they the first Asian?) group to do so. And although I am certainly not part of the #ARMY, they were actually pretty entertaining. 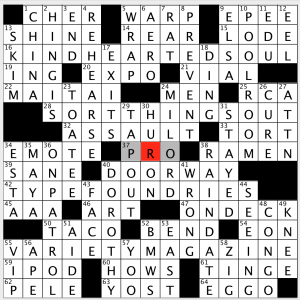 48A [Promgoing kids, for short] SRS – This is a clunky plural abbreviation, but we forgive it in this puzzle! 38D [RPI grad’s abbr.] ENGR. – Another abbreviation, but at least this is one we see in crosswords all the time. I recently commented on this blog when the actual entry ENGINEER appeared that it looked weird! Another Jonesin’ coming next week! This puzzle is for the birds! In a good way, of course! You can probably squeeze in more themers when they are under 10 letters, but this is still a feat to fit to many of them in the grid. This surely didn’t Tuez! 4.4 stars. 1D [Used “colorful” language] CUSSED – I had CURSED, and thus the error. The across entry of SOLI is not easily sussed out without a clue! [Opera songs for one] was what was used. 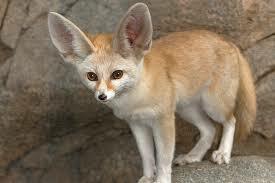 5D [African desert fox] FENNEC – This is a little tough for a Tuesday. They are kinda cute, though! 21D [__-Coburg: former Bavarian duchy] SAXE – This is also a little tough for a Tuesday, but not using it looks like it would have necessitated reworking the entire corner. Would have been nice to fit DEREK in there somewhere, though! 22D [Mooring rope] HAWSER – This is ALSO slightly tough. But in a good way. 45D [Small skullcap] BEANIE – I have too big of a head to wear one of these! 49D [Hardened (to)] ENURED – Also not great, but everything else in that corner is stellar. I’m in Spring Break mode and on vacation- hence a quick write up! 16A [*Caring person (note each starred answer’s first word)] KIND HEARTED SOUL. 28A [*Make sense of the world] SORT THINGS OUT. 42A [*They form letters] TYPE FOUNDRIES. 55A [*Source of entertainment?] VARIETY MAGAZINE. Not 100% sure I understand the theme. But the first words of the four theme answers are all synonyms in a sense. They can all complete the sentence “What _____ of work do you do?” “Manner” also kind of works in that sentence, so I suppose that’s where the title comes from. Pretty standard, mostly smooth solve. I liked TAP OUT, POOL ROOM, and ON PATROL. TYPE FOUNDRIES is new to me, and I balked at the clue for VARIETY MAGAZINE, which doesn’t seem to be an actual source of entertainment to me (I thought it might have something to do with a variety show). 2.8 stars from me. Enjoy what’s turning out to be a lovely day! This entry was posted in Daily Puzzles and tagged Elizabeth C. Gorski, Gary Cee, Lee Taylor, Matt Jones, Ross Trudeau, Todd Gross. Bookmark the permalink. Crossword Nation usually comes into my inbox like clockwork Monday evening, but I haven’t received it yet. Anyone else not get an email? On the Jonesin’ – impressive feat with all the E’s, but as with any constructing feat, the fill always suffers and it turns into an unenjoyable solve. I am happy to share a birthday with such a great artist. I like the quotes you shared in your email, Ms. Gorski, and will take them to heart. The quote in the puzzle seems particularly apt, and I enjoyed the solve, with such excellent entries as TRANSACTS, I’M NERVOUS, SIDE DOOR, SALUTE, and many others. What a great tribute! Also, I love the little hat in the emoticon. Ade, I think we started at roughly the same time, so if it has been five years, I cannot believe it either! Congrats on the milestone! Amy, when DID I start anyway? Heck, I barely know when I started! Glad to have you all on board! Actually, it wasn’t that hard to find. May 12, 2015 was my start date. I was off by a year. I’ll have to wait until 2020 for my gold watch! I did think you followed me on Fiend as well. Remember my first day on here (April 8, 2014) because I was in a hotel room in Nashville getting ready to cover the women’s college basketball national title game when typing the first review up. It appears as if Booker T,(of Booker T and the MGs), was the keyboard player of a largely if not completely instrumental group. 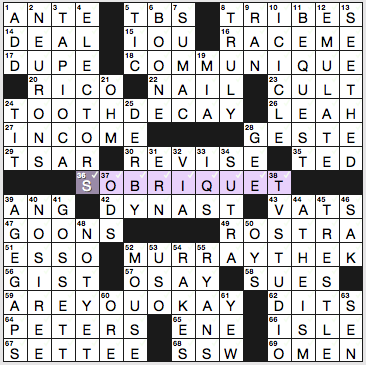 And not the group’s singer as alleged on the 2D clue in today’s WSJ puzzle. Think I agree. Although I’m totally “classical”, I remember their big hit “Green Onions”, which certainly was a catchy all-instrumental ditty. This was a big cluing error. yeah, I’ll take the maybe-or-maybe-not still current brand name over that…. I usually download my CHE puzzle on Tuesday, but the connection is not working. I tried various ways but none works. Any help or…? They’re biweekly for the next few months (summer schedule). Universal: Skim (13D) is not a type of low-fat milk, it is non-fat milk — not the same. Yes, you could say the Colts MOVED to Indianapolis. But, really, it was more an ESCAPE to Indianapolis – in the dark of the March 28-29 night, trying to get out of town before the Maryland governor signed a bill taking ownership of the Colts by eminent domain on March 29 morning. They packed up a bunch of moving vans sent from Indianapolis in the middle of the night , all of which used different routes in and out of Maryland to avoid detection by the Maryland State Police, and which were then escorted one by one by the Indiana State Police that morning from the Indiana border to Indianapolis. Not your every day move! Yes, CFXK, their “move” was probably the most surreptitious of any sports franchise by a wide, wide margin! Definitely would have gone into more detail about that, but talkinga bout Johnny U took precedence! Next time I come across a grid with “IRSAY” or “MAYFLOWER” as an entry, I’ll totally talk about the move…and hope I don’t open up too many scars for those living in the Beltway. Brian, Thank you. Summer??? Ha, Ha, Ha!! Jonesin’ puzzle: I did a quick scan of the clues and found no E’s in any of the clues. No one mentioned that. Am I right? Yes, I also saw that after noticing some of the oddly phrased clues. I liked EVERGREEN TWEET but I’ll bet that meant nothing to non-twitter users.